12 Feedbacks on "My Personal Boycott: Amazon, Ebay, KMart, Walmart"
Hakenkreuzfahnen are still available at Amazon. I guess it’s still ok to celebrate Nazism. Oh, man, David, you helped me out here. This exact thought occurred to me yesterday. I’ve been an Amazon customer since 1997 and have spent almost $100K with them over the years. And I was so pissed by their cowardice that I wanted to do the same thing. But I chickened out because I don’t have an alternative, and I love Amazon.com. The one month ban seems like a token gesture, to be sure, but I’m going to do I too. 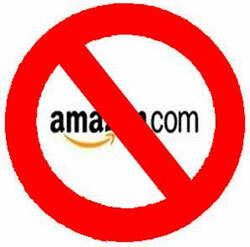 I too am banning Amazon, Ebay, PayPal and the rest of the anti American marxist brown nosers who caved into the threats made to them from the illegal feds, who obviously have a death wish. Dumped Amazon this morning. Have not bought from the rest in quite some time. I am also a very active purchases of products on eBay and Amazon. I’m standing with you in this ban. I’m sending similar notices to yours above to both. If you look at my account, you will see that I am a very active Amazon customer, purchasing films and books for 15+ years. In response to Amazon’s absurd removal of Confederate flag-related merchandise I have cancelled my Amazon Prime membership and will be purchasing absolutely nothing from Amazon for one month. I do not sell Confederate flags but I do not condone censorship either. I understand that Nazi memorabilia is not sold on your site for similar (understandably) moral objections. You are equating half of the US population with Nazis by this ban. I do not believe that American people who understand 19th century history are to be equated with Nazis. Neither do I condone censorship. I will revisit this issue on July 27, 2015. My personal ban may be extended indefinitely. How ’bout this? I bought Field of Lost Shoes on Amazon Prime Instant Video some time ago. I am going to run it, and any other CSA-centric videos, constantly, back-to-back, 24/7, til the end of July. I like boycotts as a way to express your beliefs and bring home the message to offending businesses or groups. But in this greater war on American culture I see the retail businesses as the victims every bit as much as the common citizens are victims. They are being whipsawed and harmed economically by the agendized groups. At this point they are simly trying to stay out of the cross hairs. But Bezos shills for the administration through the Washington Post and to the best of my knowledge has supported Obama. I don’t think they were as reticent as you suggest. Why wouldn’t you permanently boycott them? Not just for the reason of the confederate flag, but that they are anti-Christ, and Anti-White organizations. I had already severely limited my purchases from these corporations, but the confederate flag thing pushed me to the point where I have now cancelled my amazon account. Well, I do find Amazon & Ebay convenient and I normally buy a lot of stuff from both. I was appalled by their action, but I don’t personally actually buy a lot of Confederate flags, so I figured a month would cost those companies some real money, and I would not be cutting off my nose to spite my face.